Drawing the circle above with a 1 Roman digit thick line added 1 Roman digit to the radius, if instead we added 1 Roman digit to the diameter and calculated the circle’s area using 22/7 we get 9.504 roods = 3 x 3.168 roods which is the area inside the mean circumference of the 1 Roman digit thick line used to draw the circle. The rectification factors are not merely fix it solutions but remarkable added features that enrich the monument’s design. The red lines of each 120° angle = 6336 Roman digits, each contains a 3.168 rood sector with an arc of 6336 Roman digits the outer diameter of the Outer Bank is 6336 Roman digits, these are features of design harmony signifying we are on the right path, the message of the monuments are revealed by following paths marked by signs. 1 side of Cube A squared x pi = the area inside the Outer Bank’s outer circumference, 1 side of Cube B squared x pi = the area inside the Inner Bank’s crest, 1 side of Cube C squared x pi = the area inside the Sarsen Circle’s outer circumference. The 1:3168 scale means 1” on the map represents 3168” or 4 chains on the ground therefore using this scale the 3168” long Station Stone Rectangle would be 1” on the map its 3168 Roman palm perimeter would be 1 Roman palm on the map and the 3168 Roman digit radius would be 1 Roman digit on the map. Below: The 0.3168 Roman mile perimeter square fitted tangent around Stonehenge’s 0.248832 Roman mile circumference Outer Bank refers to a 31680 mile perimeter square fitted tangent around the earth’s 24883.2 mile circumference, the Outer Bank’s 3168 Roman digit radius relates to the earth’s 31680 furlong radius. Before the equator bulged it had a 24883.2 mile circumference = 18247.68 Roman leagues and 18247.68” is how far it turned in 1 second which is recorded by the square’s 18247.68” perimeter (= 0.3168 Roman miles). 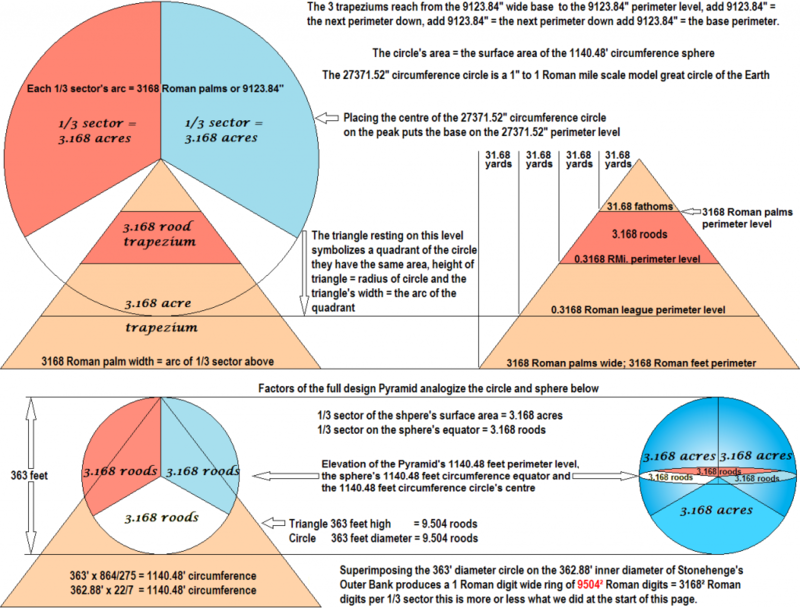 The 18247.68 inch circumference circles above are models of great circles of the earth on the scale of 1 inch to 1 Roman league, the 27371.52 inch circumference circle below is a model great circle of the earth on the scale of 1 inch to 1 Roman mile. The earth’s 7920 mile diameter x 864/275 = 24883.2 miles circumference = 18247.68 Roman leagues or 27371.52 Roman miles. The outer circumference of Stonehenge’s Outer Bank encloses 2.605949673 acres; multiply by the Pyramid’s slope angle tan 1.273148148 = 3.31776 acres which is the area of one of the 0.3168 Roman mile perimeter squares above, one square fits tangent around Stonehenge and the other square is the Pyramid’s ½ way level. 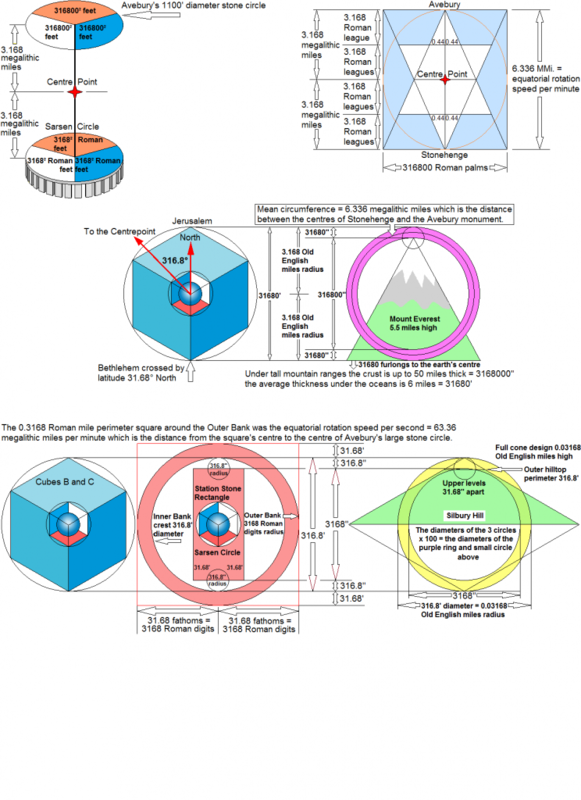 One square’s 3.31776 acres x tan 1.273148148 = 4.224 acres which is the area of the Pyramid’s full design vertical section or the area of one of the 0.3168 Roman mile circumference circles. The earth’s 24883.2 mile circumference x tan 1.273148148 = 31680 miles which equals the circumferences of the earth and the moon (via 22/7) and 31680 miles is also the perimeter of a square fitted tangent around the earth. Stonehenge’s Outer Bank has a 0.248832 Roman mile circumference; multiply by tan 1.273148148 = 0.3168 Roman miles which is the perimeter of the square fitted tangent around the Outer Bank. The original equatorial rotation speed per second calculated via 864/275 was 0.3168 Roman miles = 18247.68” this was when the equator had no bulge and had a 18247.68 Roman league circumference. Each 18247.68” circumference circle represents a scale model 18247.68 Roman league circumference great circle of the earth, an 18247.68” circumference circle = 4.224 acres via 864/275 and equals the area of the full design vertical section, 4.224 acres x 864/275 = 1327104 acres which is the area of the 3168 Roman palm square base which has a 3168 Roman feet perimeter. The 13.27104 acres of the base x tan 1.273148148 = 16.896 acres and this is the area of a 3168 Roman feet circumference circle, the full design vertical section is an analogue of one quadrant of the 3168 Roman feet circumference circle.